Hard to Find Sizes from .30UNM to 1.00UNM, 0000-160 to 00-90 inch sizes. Recommended for large batches of workpieces. The outside diameter is adjusted by changing the turning diameter. These rolling dies are recommended for machining small and medium workpiece batches. 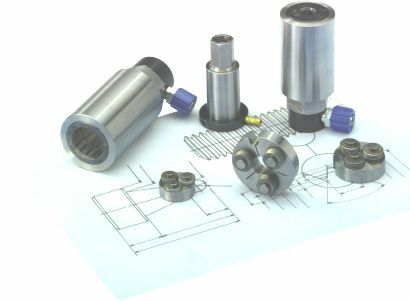 The diameter on the thread flank can be adjusted by means of the nut of type R die holders. The outside diameter is adjusted by modifying the turning diameter before thread rolling. Take care that the thread is not full and that a slight flat remains on top of the profile. The use of these dies is very economical thanks to their adjustment possibilities.